Background and hypothesis Prolonged electroencephalographic (EEG) discontinuity has been associated with poor neurodevelopmental outcomes after perinatal asphyxia but its predictive value in the era of therapeutic hypothermia (TH) is unknown. In infants undergoing TH for hypoxic-ischaemic encephalopathy (HIE) prolonged EEG discontinuity is associated with cerebral tissue injury on MRI and adverse neurodevelopmental outcome. Method Retrospective study of term neonates from three UK centres who received TH for perinatal asphyxia, had continuous two channel amplitude-integrated EEG with EEG for a minimum of 48 h, brain MRI within 6 weeks of birth and neurodevelopmental outcome data at a median age of 24 months. Mean discontinuity was calculated using a novel automated algorithm designed for analysis of the raw EEG signal. Results Of 49 eligible infants, 17 (35%) had MR images predictive of death or severe neurodisability (unfavourable outcome) and 29 (59%) infants had electrographic seizures. In multivariable logistic regression, mean discontinuity at 24 h and 48 h (both p=0.01), and high seizure burden (p=0.05) were associated with severe cerebral tissue injury on MRI. A mean discontinuity >30 s/min-long epoch, had a specificity and positive predictive value of 100%, sensitivity of 71% and a negative predictive value of 88% for unfavourable neurodevelopmental outcome at a 10 µV threshold. Conclusions In addition to seizure burden, excessive EEG discontinuity is associated with increased cerebral tissue injury on MRI and is predictive of abnormal neurodevelopmental outcome in infants treated with TH. The high positive predictive value of EEG discontinuity at 24 h may be valuable in selecting newborns with HIE for adjunctive treatments. Electroencephalographic discontinuity is associated with adverse neurological outcomes in term infants after hypoxic-ischaemic encephalopathy. In term infants receiving therapeutic hypothermia, electroencephalographic discontinuity calculated using a novel algorithm at 24 h is associated with cerebral tissue injury on MRI and with adverse neurodevelopmental outcomes. This system may provide a useful tool for early risk stratification when adjunctive therapies are more beneficial. Hypoxic-ischaemic encephalopathy (HIE) affects up to 6 per 1000 live births in industrialised nations and is an important cause of disability in survivors.1 ,2 Mild therapeutic hypothermia (TH) is a safe and effective neuroprotective intervention and is now standard care in resource-rich settings.3 ,4 TH increases the number of survivors without neurodisability, with the benefits persisting into childhood.5 The number needed to treat is nine,4 so there is a need to stratify patients who may stand to benefit from adjunctive therapies, and to improve the precision of prognostic information for families and clinicians. Severely abnormal EEG and aEEG background patterns are associated with adverse outcome,9 ,10 but the precise features of the background that predict poor outcome are uncertain and qualitative assessments lack diagnostic precision and are susceptible to interobserver variation. In order to improve the objectivity of EEG assessment in the newborn, we developed and applied computer software for automated quantification of EEG discontinuity. We aimed to test the hypothesis that an objective measure of EEG discontinuity is associated with cerebral tissue injury on MRI and neurodevelopmental outcome. We studied infants who received TH between October 2007 and July 2011 in three tertiary UK neonatal intensive care units: the Royal London Hospital, Homerton University Hospital, and Norfolk and Norwich University Hospital. Data were obtained as part of standard clinical care. Infants received intensive care and TH according to local guidelines, which were informed by the UK TOBY Cooling Register Clinician's Handbook.12 Sentinel events were defined as a sustained (preterminal) fetal bradycardia necessitating delivery of the infant, antepartum haemorrhage secondary to placental abruption, placenta praevia, cord prolapse or rupture, uterine rupture and shoulder dystocia. Recordings obtained from the aEEG monitors (BRM2/3 BrainZ Instruments, Natus Medical, California, USA) were reviewed off-line (by DKS and JMD) to visually identify seizure-free and minimum artefact 2-h epochs at 24 h and 48 h of age. Single channel cross-cerebral (P3–P4) EEG data were exported to Excel, and continuity was analysed in 1-min epochs using software that we developed using MATLAB (The MathWorks, Massachusetts, USA), similar to that validated in previous work by comparing with visual assessment.13 The system detected an interval if the absolute amplitude of the EEG was less than 15 µV with respect to the baseline for at least 6 s and therefore discontinuous; the analysis was repeated with a 10 µV threshold. The 10 µV and 15 µV thresholds were chosen to reflect the fact that the EEG from healthy term newborns is represented by more lower-voltage high-frequency waveforms in contrast to preterm infants or infants with encephalopathy.14 For each recording the mean of the total interval length per epoch, the discontinuity value, was calculated and expressed in seconds. For an interval to be detected the minimum period of 6 s was chosen in order to avoid including normal short quiescent periods seen in tracé alternant.15 In order to allow assessment of temporal variability in EEG discontinuity, the length of the analysis epochs was 1 min; intervals that started in the preceding epoch and continued into a subsequent period were included in the analysis. EEG discontinuity greater than 30 s/min was regarded as a predominantly discontinuous trace, as this equates to 50% discontinuity within a minute implying that the EEG is predominantly discontinuous at the given amplitude threshold. This is similar to approaches previously applied in visual assessment of term infant EEG recordings.7 For four traces, the analysis was repeated which yielded the same mean interval duration. MRI was performed at local centres with conventional T1-weighted and T2-weighted sequences acquired at 1.5 T. Anonymised images were rated independently by two investigators (OK and JPB), who were blind to the clinical data. The pattern of MRI injury was classified into two groups, using the system described by Rutherford et al,16 which has prognostic value in the era of TH. This method includes rating the posterior limb of the internal capsule, basal ganglia and thalami, and the subcortical white matter. Group 1 had a severe pattern of injury that predicts poor outcome, defined by the classification system as death or one or more of: mental development index score less than 70 (≥2 SD below the mean) on the Bayley Scales of Infant Development (BSID II); score of 3–5 on the Gross Motor Function Classification System; or bilateral cortical visual impairment with no useful vision. Group 2 had either normal images or less severe patterns of injury associated with normal or mildly abnormal (favourable) neurodevelopmental outcome. These patterns of injury were used to assign infants into either the favourable or unfavourable MRI outcome group. For the purposes of neurodevelopmental outcomes, infants were classified in the unfavourable outcome group if they had cerebral palsy that impaired independent walking; severe seizure disorder; hearing impairment requiring hearing aids or bilateral cortical visual impairment with no useful vision. Infants with better outcomes were placed in the favourable outcome group. Neurodevelopmental outcomes were assessed at multiple local centres, with tools of assessment including both BSID and Griffiths. Data were analysed using SPSS V 22.0 (IBM). We investigated discontinuity at 10 µV and 15 µV thresholds at both 24 h and 48 h time epochs, seizure burden, Apgar score at 10 min, use of anticonvulsants, worst arterial cord or infant pH and base deficit within the 1st hour in univariable analyses with cerebral tissue injury on MRI using χ2 statistic for categorical variables and analysis of variance for continuous variables. Seizures were classified as previously reported for this cohort.8 Seizures were defined as rhythmic spike and/or wave activity on the raw EEG lasting at least 10 s in the absence of artefact. A low seizure burden was defined as no seizures or sporadic seizures lasting <15 min in a single hour. A seizure episode lasting ≥15 min per hour for any hour during the period of monitoring including the cooling and rewarming period was classified as high seizure burden. Significant factors from the univariable analyses were examined in a binary logistic regression model to calculate odds ratios (OR), assessing their association with MRI outcome. The area under the receiver operating characteristic (ROC) curve was calculated for the relationship between discontinuity >30 s and unfavourable MRI outcomes. The OR, positive predictive value (PPV), negative predictive value, sensitivity and specificity were calculated for the relationship between discontinuity >30 s and unfavourable neurodevelopmental outcomes. Two-sided p values were regarded as significant at the 0.05 threshold. Of 52 eligible infants, 3 were excluded due to incomplete EEG recordings at 48 h. The clinical characteristics of the remaining 49 are described in table 1 and the EEG discontinuity measures, MRI findings and neurodevelopmental outcomes are detailed in table 2. Seventeen (35%) of the study cohort had MRIs predictive of unfavourable outcome. 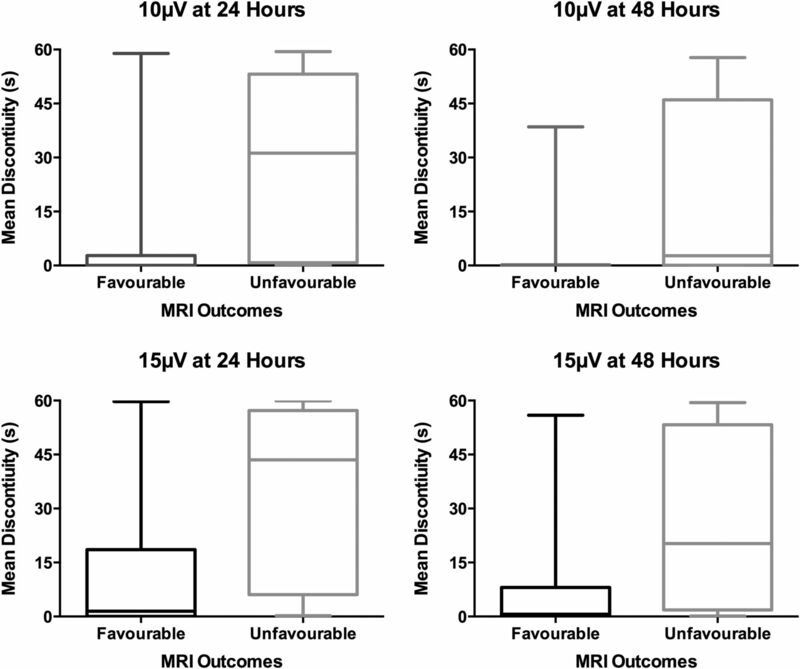 On univariable analysis, factors associated with the unfavourable pattern of MRI outcome were high seizure burden (p=0.003), discontinuity at 24 h (p<0.001) and at 48 h (p<0.001) at 15 µV threshold (table 3). In multivariable logistic regression high seizure burden (OR 4.2, 95% CI 1.01 to 17.48, p=0.05), mean discontinuity at 24 h (OR 1.04, 95% CI 1.01 to 1.08, p=0.01) and at 48 h (OR 1.05, 95% CI 1.01 to 1.10, p=0.01) were associated with severe cerebral tissue injury on MRI (using the method described by Rutherford et al16). Of infants with unfavourable MRI outcomes, the median (IQR) discontinuity was 31.2 s (0.9, 51.8) and 43.5 s (8.6, 56.5) at 10 µV and 15 µV, respectively, at 24 h, and 2.7 s (0.1, 42.7) and 20.3 s (1.9, 53.2), respectively, at 48 h (figure 1). A mean discontinuity >30 s per 1-min epoch had a PPV of 90% and 86% at 24 h and 48 h, respectively (10 µV threshold) and of 75% and 80% at 24 h and 48 h (15 µV threshold) for group 1 (unfavourable MRI outcome). The area under the ROC curve at both thresholds and both time points was between 0.78 and 0.81 showing a high predictive value for discontinuity at both time points and thresholds. To investigate the possibility of collinearity between seizure burden and discontinuity (24 h, 10 µV threshold) in the regression model we calculated correlation between these two variables and found the Pearson coefficient to be low, 0.30 (p=0.036). Plots comparing mean discontinuity and MRI outcome (favourable or unfavourable). The left panels show mean discontinuity at 24 h and the right panels at 48 h. The top panels use a 10 μV threshold and the bottom panels a 15 μV threshold. The box edges show the IQR and the whiskers the range. Neurodevelopmental outcomes were available for 43/49 (88%) of the children (table 2). Median age (IQR) of last follow-up was 24 (24, 24) months. Fourteen of 43 (33%) children had unfavourable clinical outcomes: 4 had died, 6 had cerebral palsy, 2 required bilateral hearing aids for profound sensorineural hearing loss, 1 had autism, seizures and global speech delay, and 1 had seizures and unilateral hearing loss (table 2). Ten of the 14 children with unfavourable outcomes had a discontinuous trace (>30 s). For these 14 children, the median (range) discontinuity was 50.3 s (9.6, 55.1) and 55.2 s (24.8, 58.0) at 10 µV and 15 µV, respectively, at 24 h and 18.1 s (0.1, 47.7) and 42.8 s (5.3, 53.3) at 48 h (figure 2). A mean discontinuity >30 s per 1-min epoch has a PPV of 100% and 87% at 24 h and 48 h, respectively, (10 µV threshold) and of 91% and 90% at 24 h and 48 h (15 µV threshold) for unfavourable neurodevelopmental outcome (table 3). Plots comparing mean discontinuity and neurodevelopmental outcome. The left panels show mean discontinuity at 24 h and the right panels at 48 h. The top panels use a 10 μV threshold and the bottom panels a 15 μV threshold. The box edges show the IQR and the whiskers the range. Of the 14 children with unfavourable clinical outcomes, 10 had MRIs predictive of unfavourable outcome. Of the remaining four children, two had profound bilateral hearing loss and one had seizures and unilateral hearing loss, which the MRI system does not predict. One infant died at 6 months from complications of evolving cerebral palsy. For the 29 children with favourable neurodevelopmental outcomes only 1 had EEG discontinuity >30 s at both time epochs and voltage thresholds. Six of these 29 children had MRIs that would predict likely neurodisability: 3 of these children had neurodevelopmental abnormalities including mildly impaired cognition, and/or delayed speech and language development, and 3 were classified as normal at the time of assessment. Overall, the correlation between MRI and neurodevelopmental outcome was good: Pearson's R=0.62 (p<0.001). Of the six children lost to follow-up, five had MRI predictive of favourable outcomes. Our study indicates that excessive EEG discontinuity assessed objectively with our automated software is associated with increased cerebral tissue injury on MRI, and is independently predictive of abnormal neurodevelopmental outcome in infants with HIE who have undergone TH. This association was statistically significant at 24 h and 48 h of age, at 10 μV and 15 μV thresholds. Using a discontinuity cut-off of 30 s, PPVs of 75–90% were obtained for MRI-inferred outcomes and even higher PPVs for neurodevelopmental outcomes. The sensitivity for adverse neurodevelopmental outcome was greatest at 24 h at 71% whereas the specificity at this time was at least 97%. This highlights the importance of early EEG monitoring in identifying infants who are likely to benefit from therapeutic interventions. 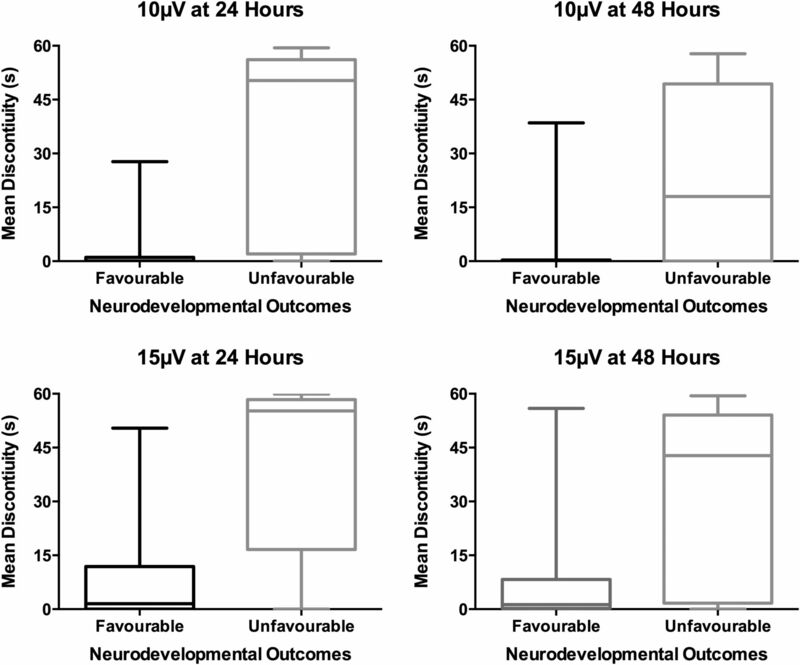 Among infants with unfavourable MRI outcomes, the median discontinuity values dropped from 31.2 s and 43.5 s at 24 h to 2.7 s and 20.3 s at 48 h at 10 μV and 15 μV, respectively, that is, to below 30 s at both voltage thresholds. Hence in infants undergoing TH, the PPV of a discontinuous trace for cerebral tissue injury on MRI is greater at 24 h than at 48 h with a substantial number of babies with poor MRI outcomes having EEG discontinuity values less than 30 s at 48 h. This method may provide an important tool for risk stratification in early postnatal life when adjunctive therapies are most likely to be beneficial. In earlier work we found that high seizure burden (seizures longer than 15 min/h) was associated with brain tissue injury,8 but we were unable to investigate the contribution of discontinuity, and its co-occurrence with seizure burden, to tissue injury and outcome due to technical limitations. The novel automated software we have developed for reliable quantification of discontinuity from cot-side recordings of the EEG has now enabled such analysis: the evidence for collinearity between seizure burden and discontinuity was weak, which suggests that the point estimates of effect of each of these predictor variables in the model are likely to be reliable. Our novel automated software analysed single channel cross-cerebral EEG data, therefore it could be used with other aEEG/EEG software from which the raw EEG data can be extracted. Previous studies have shown a relationship between features of multichannel EEG background17 as well as limited channel EEG/aEEG measures18 and MRI outcomes in neonatal encephalopathy in the precooling era, in that increased EEG depression is associated with more severe abnormality on cerebral MRI. Studies have shown the predictive value of EEG discontinuity lasting at least 30 s with adverse neurodevelopmental outcomes in infants with HIE6 as well as in groups of infants with broader neurological diagnoses7 in the precooling era. Menache et al7 reported that all 10 babies (100%) with a predominant interburst interval duration of 30 s or greater had adverse neurological outcomes; however, in that study the analogue EEG recordings may have been shorter with a minimum duration of 30 min. The use of automated quantification of background EEG activity has previously been demonstrated in infants.13 ,19 In a qualitative multichannel video-EEG study, Nash et al9 found that a persistent burst suppression or continuous low-voltage pattern beyond 24 h of age in infants undergoing TH was highly predictive of brain injury on MRI. Using qualitative aEEG background patterns, a summary trend of the raw EEG, for term infants who had undergone TH, Thoresen et al10 showed that the PPV of an abnormal aEEG background for poor outcome in cooled infants was >90% at 24 h in contrast to normothermic infants in whom the PPV of an abnormal trace reached 90% by age 12 h. In the present study using an unbiased objective measure of discontinuity, we found similar PPVs at 24 h and 48 h of age in cooled babies and the PPV of the lower voltage threshold was greater. Although our study was primarily designed to investigate the relationship between EEG discontinuity and MRI outcomes, we were also able to show an independent significant relationship between discontinuity and neurodevelopmental outcomes with a high PPV at 24 h. We also found high concordance between MRI outcomes and later clinical outcomes at neurodevelopmental follow-up. The high early PPV of EEG discontinuity for abnormal MRI and neurodevelopmental outcomes may be a useful tool for early stratification of asphyxiated newborn babies for potentially beneficial adjunctive neuroprotective therapies. The authors thank Dr Courtney Wusthoff for her assistance with rating the seizure burden. The authors also thank all the nursing and medical staff from the study sites and all the families.
. Atlas of neonatal electroencephalography. New York: Raven Press, 1977. Contributors JMD collected data, carried out the raw EEG data analysis, assisted with the statistical analysis, wrote the first draft of the manuscript and approved the final version of the manuscript. DW developed the EEG software used to measure discontinuity, assisted with writing the manuscript and approved of the final version of the manuscript. P Clarke obtained ethics approval, collected data, assisted with writing the manuscript and approved the final version of the manuscript. OK reviewed the MRIs and approved of the final version of the manuscript. P Chisholm carried out neurodevelopmental testing and approved the final version of the manuscript. JPB reviewed the MRIs, assisted with writing the first draft of the manuscript, assisted with statistical analysis and approved the final version of the manuscript. DKS conceived the study, collected data, assisted with the EEG reviews, statistical analysis, writing the first draft of the manuscript, approved of the final version of the manuscript and is guarantor. Funding JPB received funding support from Theirworld. Ethics approval UK REC reference 14/EE/0205. Data sharing statement We have previously published one paper from this cohort relating seizure burden to brain injury in cooled babies and this is the remaining information.